Step 1: Heat grill to medium-high. Grill corn 12 minutes or until charred in spots, turning. Step 2: Thread swordfish steak onto 8 soaked bamboo skewers. Brush fish and zucchini with canola oil; sprinkle with chili powder and salt. Grill fish and zucchini 6 minutes or until fish is opaque, turning once. Step 3: Cut corn off cobs, chop zucchini and toss with chickpeas, mint, lime juice, oil, and salt. Serve with kabobs. 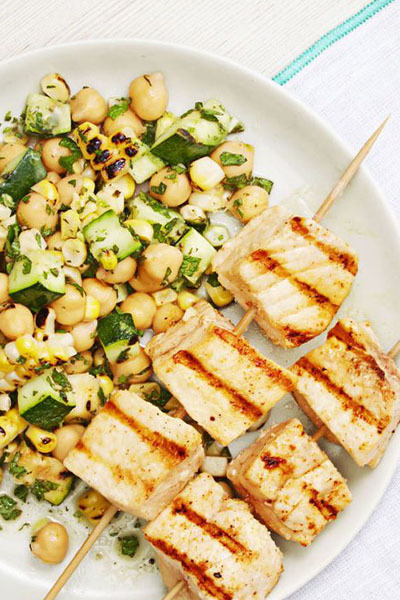 Kick your salad game up a notch with this recipe from GoodHousekeeping! Tip: Use metal skewers to save yourself the half hour needed to soak bamboo ones in water.